It's a good idea to rip Blu-ray to standard video to keep your Blu-ray discs from scratched, damaged, or manage your movies in more convenient way. However, many people complain that the video quality is not as clear as the original Blu-ray after ripping. Generally speaking, an ordinary Blu-ray movie is often 25-50GB in size while the converted standard videos would be only hundreds of MB. So we have to face the problem that the code compress process would destroy most of unimportant data and the video quality get bad. Then is there an available way to resolve the issue? Of course. The answer is to rip Blu-ray High Definition video formats, for these HD videos are often bigger than standard video and decrease the video damage. So the HD video seems to be lossless compared with the original Blu-ray. Download and install EaseFab Blu-ray Ripper on your computer and run it. Now please insert the Blu-ray disc into your BD drive (necessary for ripping BD). 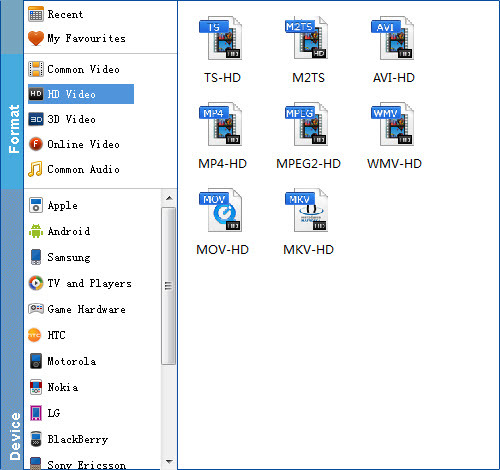 DVD, DVD folders, ISO files and IFO files are also supported. Tips: The Blu-ray ripping software come with preset formats for more than 150 devices, such as Apple TV, iPhone 5, Samsung, iPhone 4S, iPod nano, iPhone 4, HTC, iPod touch 5, Creative Zen, Sony, Sandisk, Motorola, Archos, Nokia, Zune, BlackBerry, iRiver, PSP, Xbox 360, PS3 and more. When you finish all settings, click the Convert button to activate the Blu-ray to 720p/1080p ripping process. Movies converted from your Blu-ray files to 1080p will give great visual quality. The only thing is that the larger files with more pixels will result in much slower conversions. Get the EaseFab tool to start your conversions today!